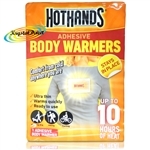 Hot Hands Adhesive Body Warmers comfort you from the cold anywhere you are - use for daily warmth or whilst participating in sports. 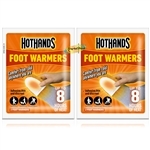 HotHands Foot Warmers are thin, discreet single-use air-activated heat packs that adhere to the underside of the sock and provide 8 hours of continuous warmth to the feet. Available as a twin pack. 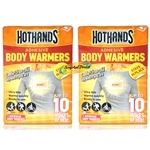 Open the sachet by hand; exposure to air starts the warming action. To protect feet from the cold, remove the paper backing and adhere one warmer to the outside of the sock underneath the toe area. Wear the sock and warmer in an appropriate shoe or boot. The level of protection against the cold is to be assessed by the user. On infants or small children, directly against the skin, on frostbite, while sleeping or on desensitized skin. During intensive exercise e.g. running or jogging. For full instructions and precautions please refer to the product packaging. Open the sachet by hand; exposure to air starts the warming action. 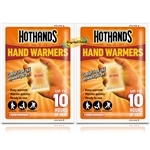 To protect hands from cold, hold the warmer in an enclosed area such as a pocket or mitten or place inside a glove. The level of protection against the cold is to be assessed by the user. On infants, on frostbite, while sleeping or on desensitized skin. 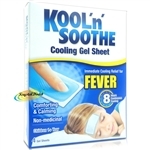 Kool n Soothe Fever are designed to provide immediate cooling relief to your hot feverish child. With no need for preparation they are ready to use straight from the pack and once placed on the forehead they deliver cooling relief for up to 8 hours. Safe to use with medication and gives maximum comfort to your hot feverish child meaning maximum comfort for him/her and reassurance for you. Kool n Soothe Fever can be used whenever you feel the need for cooling relief headache, to aid restful sleep. Safe to use with pain relief medication for maximum comfort. Ready to use and with non need for refrigeration, each gel sheet stays in place and provides up to 8 hours of cooling relief. Kool 'n' Soothe migraine sheets can be removed easily without leaving any sticky residue. 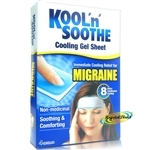 For best results Kool 'n' Soothe Migraine should be used at the first sign of and headache. Cura Heat Period Pain provides targeted, temporary 12 hour warming relief from the aches, discomfort and cramps associated with period pain. 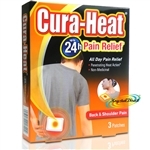 Cura-Heat provides targeted temporary 12 hour warming relief from minor muscular and joint aches and pains. Just open the sachet and apply to clothing/ underwear where the heat radiates through to the source of pain- increasing circulation, decreasing stiffness and relaxing sore muscles. Fragrance free, non-medicinal and with a thin discreet design, they are ideal to use anywhere. If misused heat packs can cause burns even at low temperature. Follow instructions and monitor frequently. To prevent the risk of burns. Do not apply heat pack on very thin clothes (eg tights or netted underwear where the skin could be exposed directly to the heat pack). Cura-Heat should be used with careful supervision on those unable to remove the product by themselves such as they elderly or physically disabled. Do not use Cura-Heat in conjunction with other creams, rubs or lotions applied to the skin or with near to other hear sources. If you have: rheumatoid arthritis; poor circulation nerve damage; sensory impairment; a skin condition; are diabetic or pregnant contact your doctor to make sure that heat therapy is appropriate for you. Do not use heat pack on thin or delicate fabrics adhesive may cause damage. 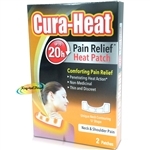 Cura Heat Neck & Shoulder Pain provides targeted, temporary 10 hour warming relief from neck and shoulder pain. The unique neck contouring U shape provides warming relief to both the back and sides of the neck and the shoulders. Just open the Cura Heat sachet and apply to clothing / underwear around the base of the neck and the heat will radiate through to the source of pain increasing circulation, decreasing stiffness and relaxing sore muscles. The Cura Heat Neck and Shoulder Pain patch is fragrance free, non medicinal and with a thin discreet design they are ideal to use anywhere. If misused heat packs can cause burns even at low temperature. 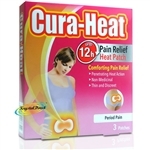 Cura Heat Back & Shoulder Pain are small discreet rectangular heat packs that provide targeted, temporary 12 hour warming relief from minor muscular and joint aches and pains. Just open the Cura Heat sachet and apply to clothing / underwear where the heat radiates through to the source of pain increasing circulation, decreasing stiffness and relaxing sore muscles. The Cura Heat Back and Shoulder Pain patch is fragrance free, non medicinal and with a thin discreet design, they are ideal to use anywhere.